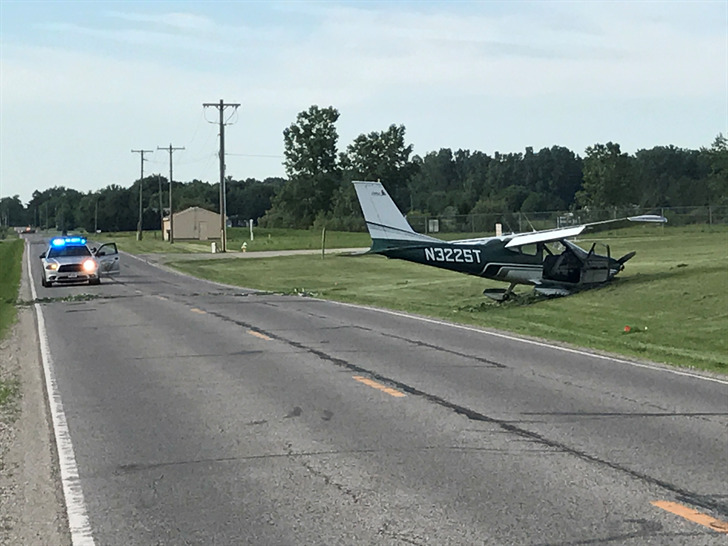 On July 5, 2017, at 1730 eastern daylight time, a Cessna 177, N3225T, collided with the terrain during a forced landing in Wauseon, Ohio. The certified flight instructor (CFI) and student pilot were not injured; the passenger received minor injuries. The airplane was substantially damaged. The airplane was registered to and operated by a private individual as a Title 14 Code of Federal Regulations Part 91 instructional flight. Visual flight rules conditions existed near the accident site at the time of the accident, and a flight plan had not been filed. The flight departed Bolton Field Airport (TZR), Columbus, Ohio, at 1615 en route to the Fulton County Airport (USE), Wauseon, Ohio. The CFI reported they were landing at USE when the accident occurred. He stated they overflew the airport and entered a left downwind for runway 9. During the base leg to final approach turn, the engine lost power. The CFI took control of the airplane and with insufficient altitude to reach the runway, he landed the airplane in a corn field just short of the runway where it contacted a ditch. The CFI reported to a Federal Aviation Administration (FAA) Inspector the airplane was filled with fuel, 42 gallons, at the beginning of the day. They practiced touch and go landings for 1 hour 15 minutes in the morning. They then landed, picked up a passenger and flew to TZR where they had lunch prior to returning to USE. The round-trip flight between TZR and USE was about 2 hours 30 minutes resulting in a total flight time of about 3 hours 45 minutes. The engine specifications show fuel consumption at 75% power is about 11.7 gallons per hour (gph) resulting in an endurance of about 3 hours 30 minutes. The fuel consumption at 65% power is 10.14 gph resulting in an endurance of about 4 hours 10 minutes. The airplane had been equipped with a 115-horsepower engine which was changed to a 180-horsepower engine about 30 flight hours prior to the accident. The pilot stated to the FAA Inspector that they departed TZR with about 15 gallons of fuel onboard and hat he intentionally wanted a lower fuel level in the airplane because a mechanic needed to look at the fuel gauges. A FAA inspector reported that he drained 12 ounces of fuel from the airplane after the accident. He stated there was no evidence of fuel leakage around the airplane. The inspector applied battery power to the airplane and the left fuel gauge indicated full and the right fuel gauge indicated empty. The fuel gascolator had a hole in the bottom of the bowl which was consistent with impact damage. 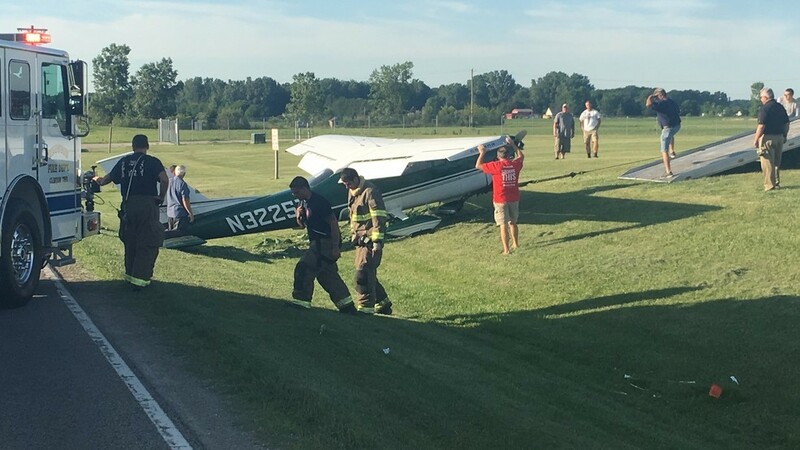 On July 5, 2017, at 1730 eastern daylight time, a Cessna 177, N3225T, collided with the terrain during a forced landing in Wauseon, Ohio. The certified flight instructor (CFI) and student pilot were not injured; the passenger received minor injuries. The airplane was substantially damaged. The airplane was registered to and operated by a private individual as a 14 Code of Federal Regulations Part 91 instructional flight. Visual flight rules conditions existed near the accident site at the time of the accident, and a flight plan had not been filed. The flight departed Bolton Field Airport (TZR), Columbus, Ohio, at 1615. The CFI reported they were landing at the Fulton County Airport (USE) when the accident occurred. He stated they overflew the airport and entered a left downwind for runway 9. During the base leg to final approach turn, the engine lost power. With insufficient altitude to reach the runway, the CFI landed the airplane in a corn field where it contacted a ditch.